Toronto Island Park, including Centre Island, Centreville Theme Park, Ward’s Island and Hanlan’s Point, will reopen to the public on Monday, July 31. The regular summer ferry schedule will resume on Monday, with the first ferry departing from the mainland for Ward’s Island at 6:30 a.m. and the first ferry departing from the mainland for Centre Island at 8 a.m. City of Toronto recreation programs will also resume on Monday. All beaches on the island will be open with lifeguards on duty, however, portions of some beaches will be in a reduced state. Signs will clearly indicate areas that are closed to the public. Olympic Island remains closed to the public due to high water levels. Online ticket sales for the ferry will resume on Friday, July 28 at http://www.toronto.ca/ferry. Island visitors are encouraged to purchase tickets in advance to avoid ticket kiosk lines. Staffing levels will be increased at the Jack Layton Ferry Terminal to provide quicker service and help visitors navigate their way from ticketing to boarding. Visitors are encouraged to check @TorontoPFR on Twitter throughout opening weekend for updates on wait times and ferry schedules. The peak period for lineups is 10 a.m. to 2 p.m. Businesses on the island are expected to resume normal business operations on Monday. Centreville Theme Park will be open. Details are available at http://www.centreisland.ca/centreville. Island park permits will be reviewed on a case-by-case basis. City staff are working with permit holders to provide any available options for rescheduling or relocating their events if affected by the parts of the park that remain closed. Permits that cannot be rescheduled or relocated will be refunded through the usual processes. Permit holders should call 311 for assistance. Further information about the flooding and status of other waterfront areas, including the Scarborough Bluffs and mainland beaches, is available at http://bit.ly/2tzD0fC. Members of the public are reminded that other areas of the city continue to experience flooding impacts and are asked to remain cautious in areas with flooding. People should pay close attention to all safety information and to updates on flooding conditions along the city’s waterfront areas. Significant erosion in the Scarborough Bluffs area has resulted in numerous landslides and an increased risk to public safety in this area. Access to the shoreline is absolutely restricted. The 3rd annual Momo Crawl is coming up on the 30th of July, 2017! 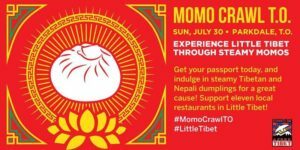 Participants with the purchase of a ‘Momo Passport’ will get to try 10 different momos, which are Tibetan and Nepali dumplings, from up to 11 participating Tibetan and Nepalese restaurants. It is held by Students for a Free Tibet (SFT) Canada, a non-profit grassroots organization made up of students, activists, and young people from all over the world who support the Tibetan freedom movement while working in solidarity with Tibetans inside Tibet. Exciting news, Masaryk Cowan Community Centre is getting a few facility upgrades! Some fresh coats of paint, a new weight room floor, and overall facility cleaning will all be coming soon! Because of these upgrades the facility will be closed from September 4 – September 10, 2017. We appreciate your patience as we conduct these necessary upgrades. The RentSafeTO: Apartment Building Standard Program took effect on July 1, 2017 and applies to all residential rental apartment buildings that are three or more storeys tall and have 10 or more apartment units. The online registration system for building owners is live, as of July 21, 2017. Next week, building owners will begin to receive a letter, with a unique Login and password that will allow them to set up an account, and register their buildings with the City. They will also receive a copy of the RentSafeTO: Building Owner Handbook that walks them through the new program. If residents or building owners have questions, concerns or comments, they can go to: www.toronto.ca/RentSafeTO, e-mail RentSafeTO@toronto.ca or call 416-396-7228, Monday to Friday, 8:30 a.m. to 4:30 p.m.
Municipal Licensing and Standards and City Planning divisions are inviting residents to have their say about proposed rules and regulations for short-term rentals (such as Airbnb) via an online survey. The survey can be found at www.toronto.ca/mlshaveyoursay and is available until August 18.
expected to be at Executive Committee in the fourth quarter of 2017. The Province of Ontario governs pay day lenders and alternative financial services such as cheque-cashing, instalment loans and rent-to-own services. In April, Ontario Bill 59 (Putting Consumers First Act) received Royal Assent, providing municipalities with additional tools to license and regulate payday lenders. It is expected to come into force in early 2018, following additional consultations on the newly proposed regulations. – amending the City of Toronto Act to permit the City to prohibit the operation of an office or limit the number of offices that may operate in a defined area. Last week, the Province released its consultation paper entitled “Strengthening Protection for Consumers of Alternative Financial Services – Phase One” and is now looking for input in developing regulations for payday lenders and alternative financial services (i.e. cheque-cashing, instalment loans, and rent-to-own services). The Province is accepting input until August 21, 2017. We want to ensure that the interest of Torontonians are taken into account as the Province seeks input on proposed regulatory changes to payday lending and alternative financial services. This notice is being sent to encourage you and your constituents to participate in the provincial consultations. 1. Regulatory registry email link titled “Comment on this proposal via email” at the bottom of the regulatory registry page for this consultation. 2. Email your comments to consumerpolicy@ontario.ca with “Consumer financial protection regulations – phase 1” as a subject line. If you have questions about this consultation, email consumerpolicy@ontario.ca. The City of Toronto will be conducting a condition assessment and inspection of the sewer system on Parkside Drive, from The Queensway to F. G. Gardiner Expressway East on the dates specified above. This project, which is part of the Council-approved 2016 Capital Works Program, will help improve local sewer collection system. Inspections will take place from 7:00 pm to 7:00 am, Monday to Friday. The STEPS Initiative is thrilled to be animating one of Toronto’s busiest connections to the waterfront as part of an international cultural exchange between the City of Toronto and the City of Chicago, (sister cities since 1991) as part of the StreetARToronto Partnership Program. Chicago artist, Justus Roe, his local Public Art Assistants, as well as members of the Parkdale – High Park community have been hard at work transforming the Roncesvalles Pedestrian Bridge to commemorate Canada’s 150th birthday and the “Year of Public Art” taking place in Chicago. They look forward to celebrating the completion of this new work with you – and ask that you RSVP by Monday, July 24th for this community event if you wish to attend! Click here to RSVP. Join them for “Building Bridges of Flavour”, a locally inspired menu of refreshments, along with local musicians, artist Justus Roe, and Mayor John Tory. The venue is served by the Queen, King, and Roncesvalles Streetcars, as well as the Martin Goodman Trail. It is wheelchair accessible, with free on-site parking. St. Joseph’s Community Engagement Council is currently looking for new members! Please check out the flyer below.